* DARMSTADT, Germany (RSR) July 17, 2018: Real Science Radio asked: “To Dr. Voytek, rather than an asset, isn’t water the enemy of prebiotic molecules? It’s the universal solvent and outside of a living organism, water dissolves life’s building blocks like amino acids, sugars like RNA and DNA, various kinds of carbohydrates, and other polymers. 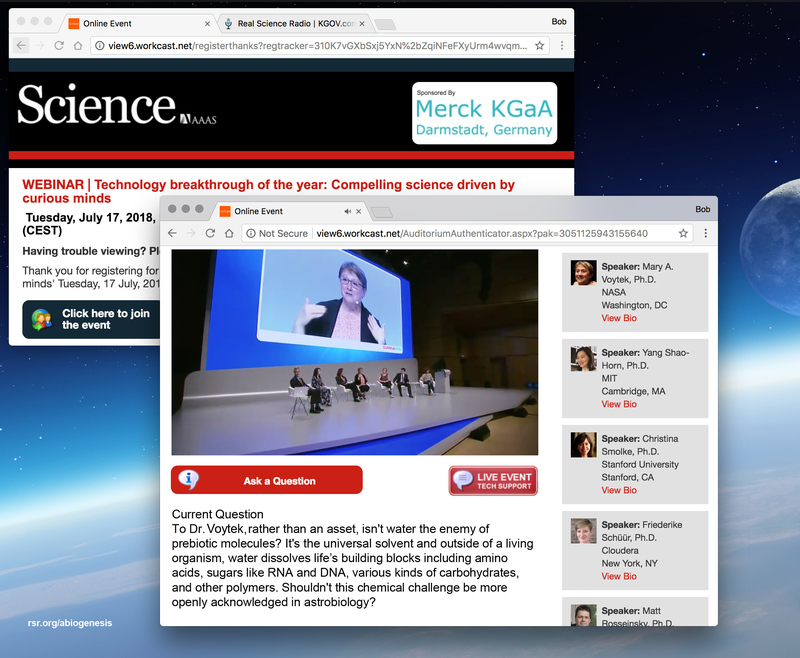 Shouldn’t this chemical challenge be more openly acknowledged in astrobiology?” This RSR challenge, one of many, was posed this week over in Germany as a question to a NASA astrobiologist by the news editor of Science. During this major AAAS event, the moderator Tim Appenzeller asked Dr. Mary Voytek about the never publicly acknowledged problem that water presents in trying to get life's compounds to arise naturally. The journal that this panel's moderator Tim Appenzeller works for, Science, reported that "water [is] lethal to the survival of DNA." The same goes for RNA and any fantastical RNA World, as even Stanley Miller, of 1952's Miller-Urey infamy, wrote in PNAS, "Sugars are known to be unstable in strong acid or base [and further] ribose [of RNA fame] and other sugars have surprisingly short half-lives for decomposition at neutral pH, making it very unlikely that sugars were available as prebiotic reagents." Thus monosaccharides and disaccharides, for example, dissolve rapidly. Scientific examination has always readily seen this evident pattern. In 1955, the first known investigation into original biological material remaining in fossils, conducted by the Carnegie Institute, stated, "Ultimately in the presence of water these peptide bonds are broken", peptides being two or more amino acids linked in a chain. As foundational compounds of all living organisms, peptides are significant throughout every cell and are vital in most biological processes. Peptides comprise all proteins, most enzymes, various hormones (including unicellular ones), they transport nutrients and are cellular building blocks. And water dissolves them. Enzymes perform and vastly speed up the chemical reactions necessary for life yet water destroys both peptide and non-peptide Ribosome enzymes (which are not made from amino acids but from RNA). Thus NASA, the BBC, ESA, Nova, and science educators like Bill Nye and Neil deGrasse Tyson, ubiquitously use a bait-and-switch to manipulate their audiences. Whereas molecules like DNA and RNA easily dissolve in water (including by deamination and depurination), materialists exploit their audiences' gullibility and ignorance, along with water's known role in sustaining life, to pretend that it is an unquestioned asset for abiogenesis, to form life from the very chemical compounds that it would disassemble. And of course, because life is information-based, even more so than it is carbon-based, abiogenesis is impossible anyway. So, while it helps to maintain existing life, NASA, water is the enemy of "prebiotic" molecules. - Water: The universal solvent enemy of prebiotic molecules (as above). - Sunlight: Biological molecules lying on a beach will be destroyed within hours of exposure to incoming solar rays which, like oxygen, will burn them up and which, like water, will disassemble them. - Ions: All organisms use ions, apparently including even bacteria, however in uncontrolled chemical reactions, in salt water for example, ions will bind with phosphate preventing the formation of molecules like RNA, DNA, etc. - Time: We'll leave this one as an exercise for the reader. How might time, which is a resource that living organisms utilize, be a barrier for the naturalistic origin of life? ​​​- Symbolic Logic: Then there’s symbolic logic. 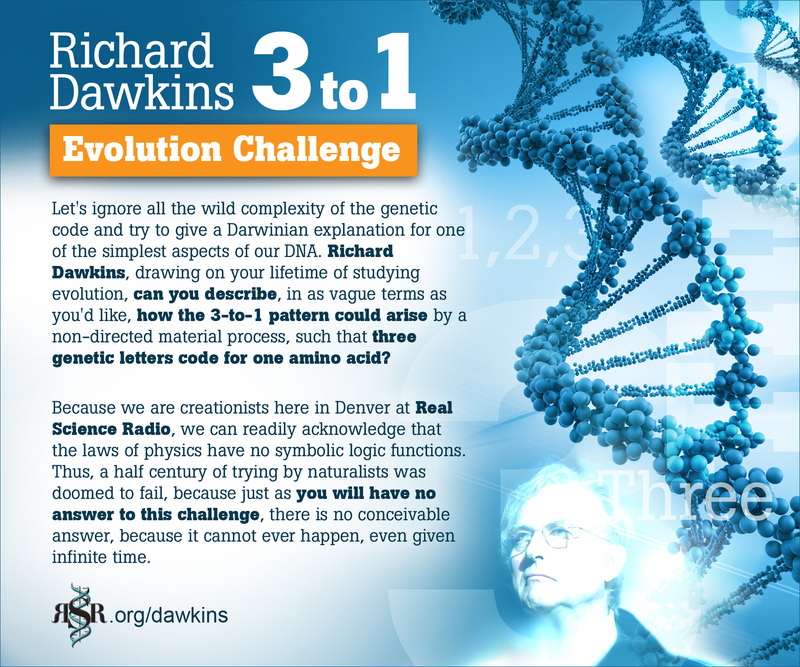 (See our Dawkins 3-to-1 Evolution Challenge just below.) It is a category error to think that a scheme (a genetic code, etc.) can arise from the ill-equipped laws of chemistry and physics. Life requires instructions for reproduction (of proteins, cells, organelles, and organisms) yet instructions are information, and information requires a code, which is something that the impoverished tools of matter, energy, and the laws of physics and chemistry are singularly incapable of generating. Functional biological information would have to arise, be encoded, stored, later retrieved, then decoded, and implemented, in order to build the next generation organism (or even the next protein in the same organism). This is like encoding information onto a DVD, then decoding and using that information. But to encode and decode requires symbolism. Therefore, a materialistic origin of life would need to implement symbolic logic. The problem is though, and this is also a fatal problem for OOL (origin of life) research. For the laws of physics and chemistry have no symbolic logic functions. So there is just no way to encode or decode any information, or even to think about the problem. So symbolism is yet another non-starter for abiogenesis, even for the simplest conceivable reproducing biological organism, let alone for the sophisticated genetic information all around us. It's been 66 years. Don’t they know yet if they made life or not? 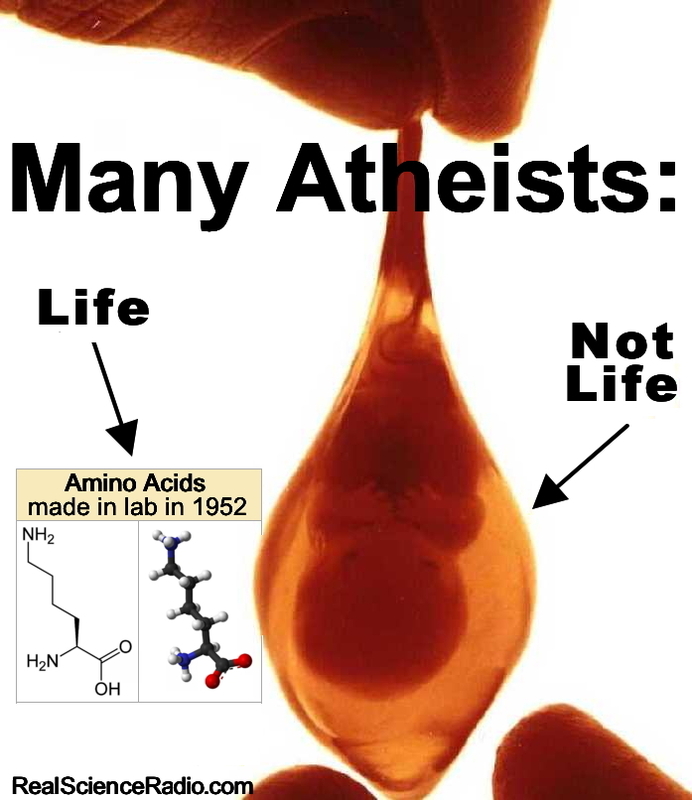 Their question mark is insufficient to counterbalance this false report, since amino acids are essential to life, but they are not life, they are acids. Further, these experimenters left out oxygen because it prevented the acids from forming and they had to immediately remove the from their solution the compounds they had formulated because otherwise they would dissolve. (See above. :) And of course Barack Obama when asked when does life begin, infamously answered, "That's above my pay grade."